The Clone Wars: Season Seven Arc To be Revealed Soon? Dave Filoni's concept sketch of a resurrected Clone Trooper Ech(at left) alongside a fan imagining of of the finished animation by Brian Snook(at right). After a feature film, five seasons on television and one on Netflix, the beloved animated series Star Wars: The Clone Wars officially drew to a close early last year. But since then we've seen that Season six was far from the end of the show. We have been treated to the Darth Maul: Son Of Dathomir comic series, the Crystal Crisis On Utapau story reel arc and we're currently anticipating the new novel Dark Disciple, all of which continue stories from the The Clone Wars in different mediums. Now it appears the trend may continue! @A207Pj Have a feeling there will be some Bad Batch info coming soon. Can't say what or how I know, tho, so pls don't ask. Just be patient. "The Bad Batch" arc that they refers to is an unreleased set of four episodes from the planned seventh season of The Clone Wars. 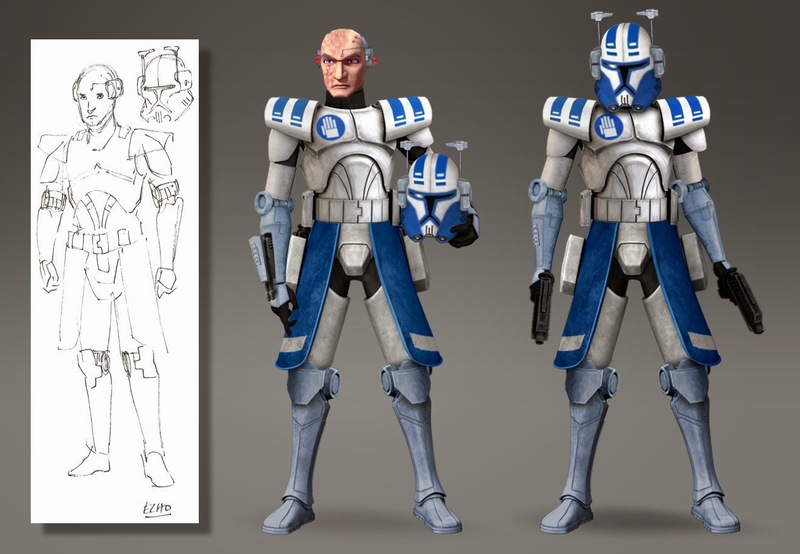 Details about this arc first surfaced last year when supervising director Dave Filoni revealed some concept art of Clone Trooper Echo, who had been presumed dead since the Citadel story arc in season three, thus confirming the character was alive. Brent Friedman, who wrote the episodes, later revealed that the arc would revolve around Captain Rex leading a group of experimental Clone Commandos, including Echo, called "The Bad Batch". Being that the episodes were fully written, and possibly even partially animated, that means that this arc is a very likely candidate to for some type of release, be it in some time of animated form, or a book or comic. We'll just have to take Brent's advice and wait and see. I desperately hope this happens! When I heard that Echo was in it, I just assumed it was set before the Citadel arc. Is there something in the story that places it after that? Looking forward to it either way. Do you guys remember that Matt Lanter's post? He posted a picture of him on studio recording some lines to Anakin. After almost a full season of Star Wars Rebels.. I miss this show more than ever. Rebels is missing a lot of what made TCW great. Am kind of over the fact that the female characters can do no wrong also. It gets old real quick. Oh very funny. Add an expletive or two and your words are converted into declarations of undying love for Jar-Jar. Very mature. As I was trying to say - the company with a mouse as its mascot really messed up cancelling this show. Now they plan on flooding the market with endless spin-off movies that will end up turning everyone off the franchise for good. Lucas should never have sold the franchise; it's not like he needed the money. He could have farmed it out to whoever but still kept overall control over what got made and what got cancelled.